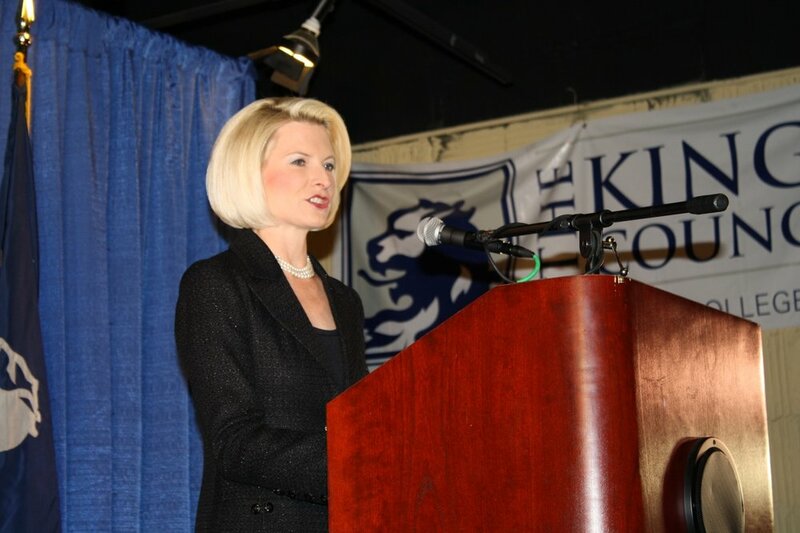 Empire State Building, NEW YORK–Callista Gingrich, wife of former Speaker of the House and presidential candidate Newt Gingrich, gave a short speech on American Exceptionalism in the student lounge on Monday, April 9. After the speech, students had the opportunity to talk to and take pictures with Callista. The King's College Republicans organized the event with help from the President's Office. "America is an exceptional nation," Callista said. But this understanding has begun to fade in recent decades, she said, starting in our schools. The majority of our high school students cannot explain the meaning of the Declaration of Independence or how the three branches of our government work together, she said. So Callista has authored a children's book, Sweet Land of Liberty, and hosted a documentary with Newt promoting the unique character of America. Citizens United Productions' "A City Upon a Hill" highlights the spirit of American Exceptionalism with historical background and interviews with Donald Trump, Michele Bauchmann, Allen West, Fred Barnes, S.E. Cupp and others. Callista is the president of Gingrich Productions, a multimedia production company based in Washington, D.C. that has produced several of its own documentaries. "We are currently in a great debate over whether America is an exceptional nation or whether we are just another country," Callista says in a promotional video. "It's up to us to decide which version of America our children will learn about and believe in." Sweet Land of Liberty features Ellis the Elephant. Ellis time-travels to key historical events in America's founding, such as the Boston Tea Party and Neil Armstrong landing on the moon. She joked at King's that she thought about using many different animals before choosing an elephant–except for a donkey. She also called President Barack Obama our "opponent," to which many students responded with applause. Her visit to King's is the first stop of four in New York City. Callista will speak again Tuesday morning at Geneva School, a private Christian school on 57th St. In the afternoon, she will speak to the Women's National Republican Club on 51st St, and in the evening she will speak to the Metropolitan Republican Club on the Upper East Side. Newt spoke Monday to community leaders and high school students in Raleigh, North Carolina. TKCR kicked off the event at 7 pm with free pizza. TKCR Executive Director Jeremy Cerone ('13) introduced Callista shortly after 7:30 pm. "Even though not many people have heard of The King's College, plenty of the right people know about our school and what we stand for and do here," Cerone said. "One of those right people is our speaker tonight, Mrs. Callista Gingrich." Christian Stempert ('14) founded TKCR last fall. The organization has since grown to 15-20 members, according to chairman Travis Drost ('13). This semester TKCR organized student trips to March for Life and CPAC 2012 and last semester joined local causes by conducting phone-banking sessions. "There's a lot of political interest at King's," Drost said. "It's a lot of talk ... but we want to be an outlet. It's about getting out in the local community and helping the cause."